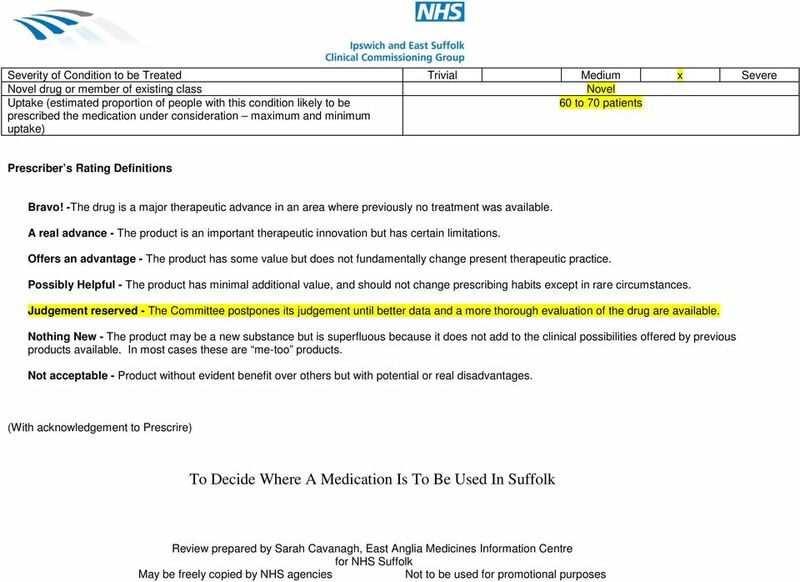 Download "NHS Suffolk Drug & Therapeutics Committee New Medicine Report (Adopted by the CCG until review and further notice)"
1 NHS Suffolk Drug & Therapeutics Committee New Medicine Report (Adopted by the CCG until review and further notice) This drug has been reviewed because it is a product that may be prescribed in primary care. 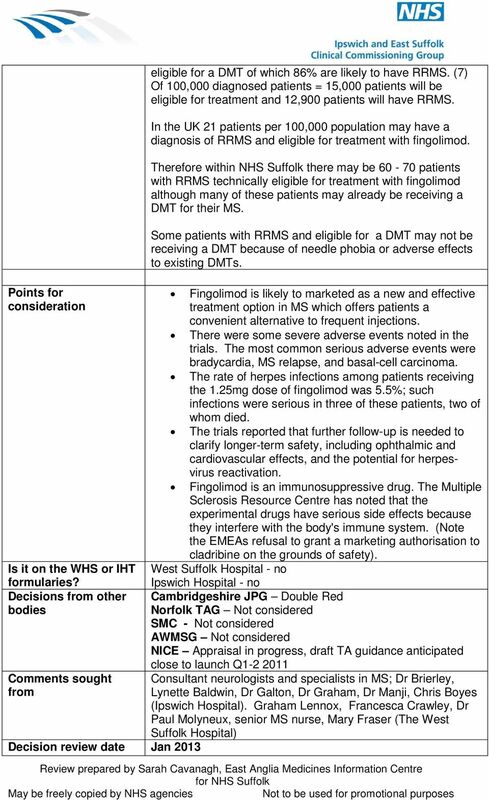 Medicine Fingolimod (Gilenya, Novartis) for relapsing - remitting multiple sclerosis (RRMS) Document status Considered at NHS Suffolk Drug and Therapeutics Committee meeting November 2010 Date of last revision 21st November 2010 Traffic light decision DOUBLE RED - Prescribing not supported in either general practice or secondary/tertiary care ( PENDING NICE) Prescribers rating Judgement reserved-the committee postpones its judgement until better data and a more thorough evaluation of the drug are available Mechanism of action Medicine class Indication Dosage Treatment alternatives Fingolimod, a novel drug, is an oral sphingosine-1-phosphate receptor modulator (S1P-R) modulator, which is thought to act therapeutically by retaining lymphocytes in the lymph nodes. This reduces infiltration of potentially auto-aggressive lymphocytes into the CNS where they could potentially attack the protective covering around the nerve fibres. (1,2) Other- immunomodulating drugs First line treatment for RRMS One 0.5mg capsule daily orally Current MS treatment consists of both symptomatic therapies which may or may not be licensed (e.g. steroids, baclofen and anti-cholinergics) as well as treatment with disease modifying therapies (DMTs) including beta-interferon 1a, glatiramer acetate, and natalizumab. 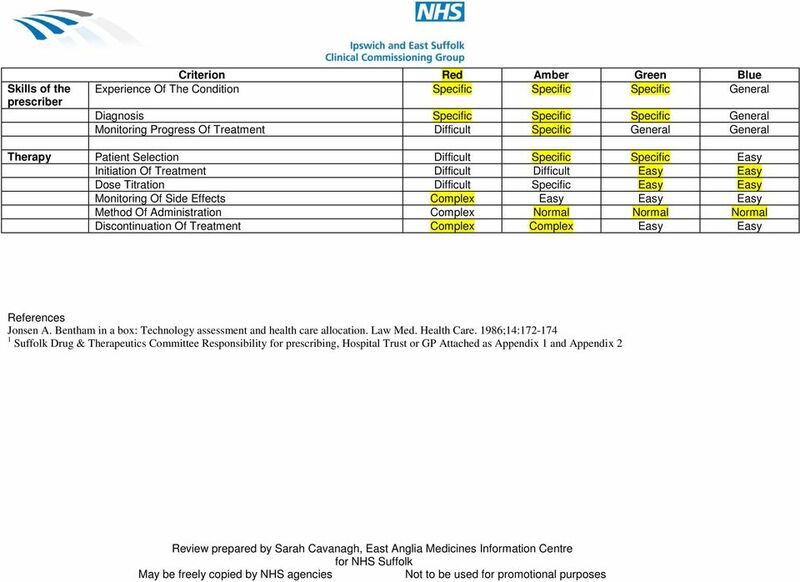 Interferon beta and glatiramer are not currently recommended by NICE (TA32), but are available in the NHS through a Risk Sharing Scheme. (1) NICE recommends natalizumab as an option for the treatment only of rapidly evolving severe RRMS (TA 127). (3) Place in therapy Future alternatives All the DMTs currently are injectable / infusion products. First line oral therapy for RRMS; may be useful in patients with needle phobia or adverse effects to existing DMTs. 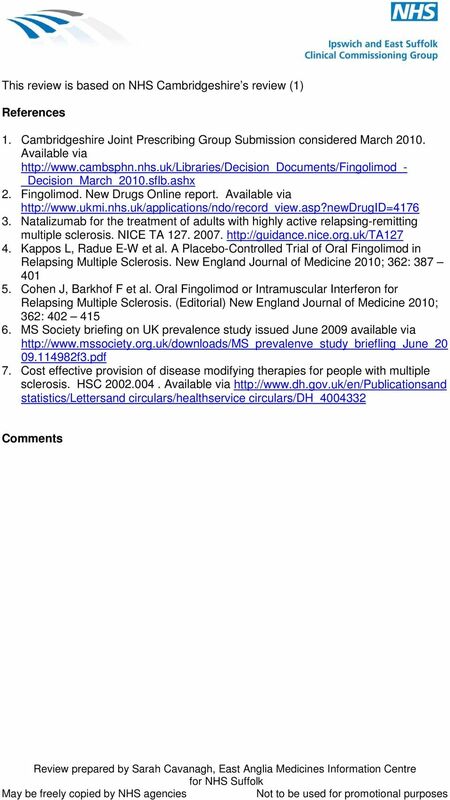 Laquinimod, fampridine-sr and add-on therapies (to betainterferon alfa): teriflunamide, daclizumab (1) (NB: cladribine, another oral drug in the pipeline for MS was refused a marketing authorisation by the EMEA in September 2010 on safety grounds). 3 fingolimod 0.5mg or 1.25mg, or IM interferon beta-1a, 30mcg weekly. A double-blind, double-dummy design was used to retain blinding. Previous recent therapy with either any type of interferon beta or glatiramer acetate was not a criterion for exclusion. As with the placebo controlled study the primary end point was the annualised relapse rate, defined as the number of confirmed relapses per year. Major secondary outcomes were disability progression and new or enlarged hyper-intense lesions on T2-weighted MRI scans at 12 months. Primary and secondary outcomes favoured fingolimod. 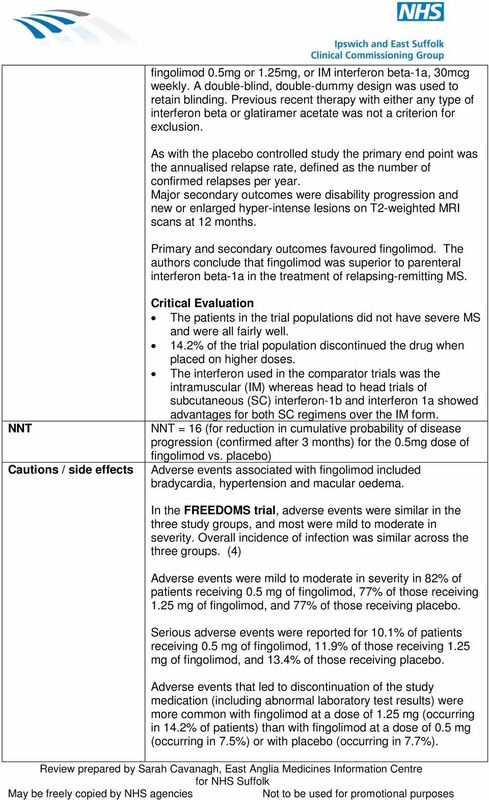 The authors conclude that fingolimod was superior to parenteral interferon beta-1a in the treatment of relapsing-remitting MS. NNT Cautions / side effects Critical Evaluation The patients in the trial populations did not have severe MS and were all fairly well. 14.2% of the trial population discontinued the drug when placed on higher doses. The interferon used in the comparator trials was the intramuscular (IM) whereas head to head trials of subcutaneous (SC) interferon-1b and interferon 1a showed advantages for both SC regimens over the IM form. 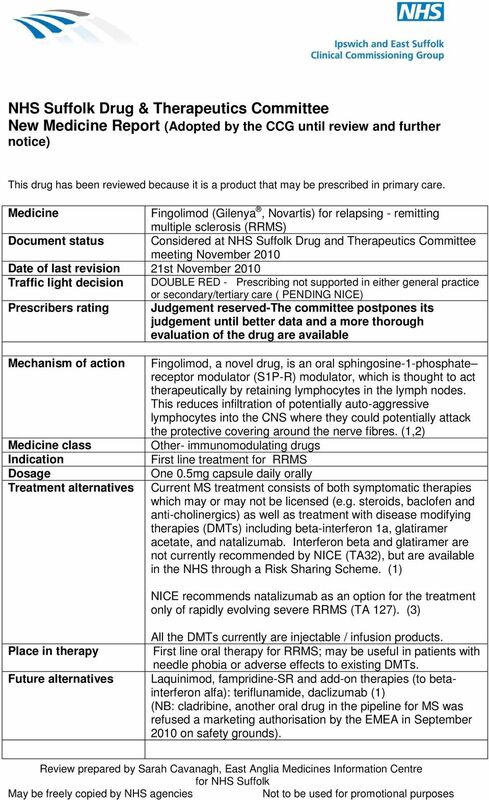 NNT = 16 (for reduction in cumulative probability of disease progression (confirmed after 3 months) for the 0.5mg dose of fingolimod vs. placebo) Adverse events associated with fingolimod included bradycardia, hypertension and macular oedema. In the FREEDOMS trial, adverse events were similar in the three study groups, and most were mild to moderate in severity. Overall incidence of infection was similar across the three groups. (4) Adverse events were mild to moderate in severity in 82% of patients receiving 0.5 mg of fingolimod, 77% of those receiving 1.25 mg of fingolimod, and 77% of those receiving placebo. Serious adverse events were reported for 10.1% of patients receiving 0.5 mg of fingolimod, 11.9% of those receiving 1.25 mg of fingolimod, and 13.4% of those receiving placebo. 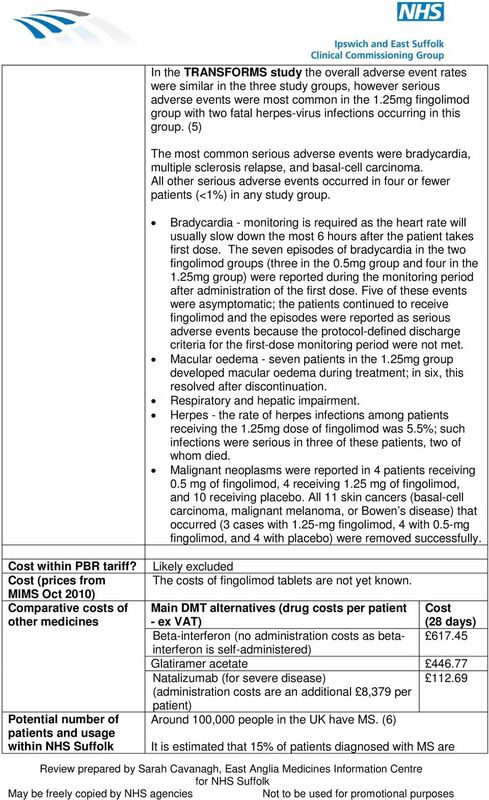 Adverse events that led to discontinuation of the study medication (including abnormal laboratory test results) were more common with fingolimod at a dose of 1.25 mg (occurring in 14.2% of patients) than with fingolimod at a dose of 0.5 mg (occurring in 7.5%) or with placebo (occurring in 7.7%). 7 Appendix 1 Key clinical trials Participants in the trials were adult patients with RRMS aged under 56, with Expanded disability Status Scale (EDSS, ranges 0 10, 10 worst) scores 0 to 5.5, and a history of one or more relapses in the previous year or two or more in the previous two years. 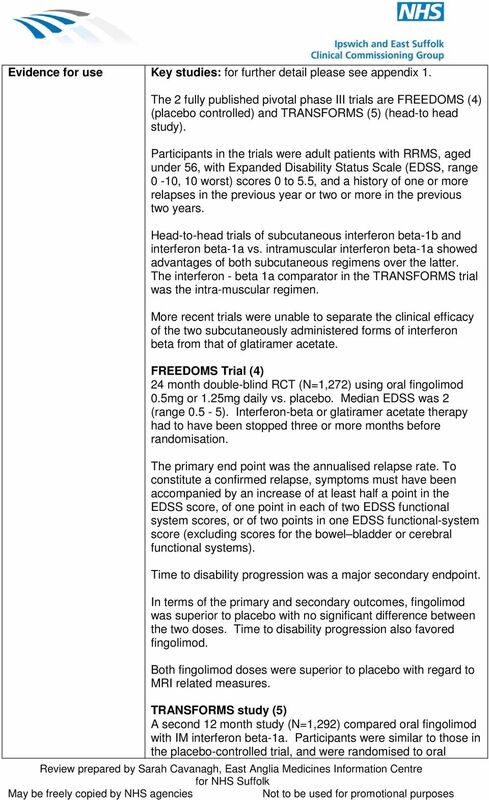 Trial Study design as above Treatment Primary Endpoint Secondary Endpoints FREEDOMS (4) 24 month double-blind Total N=1,272 Time to disability progression RCT. (major secondary endpoint). Median Expanded Disability Status Scale (EDSS) was 2 (range 0-5.5). Interferon-beta or glatiramer acetate therapy had to have been stopped three or more months before randomisation. The main reasons for withdrawal were withdrawal of consent, adverse events (including abnormal laboratory tests) and lack of therapeutic effect. More patients withdrew for adverse events in the two fingolimod groups, and more for lack of effect in the placebo group. (1,033 completed the 24 months study) Oral fingolimod 0.5mg (N=425) or 1.25mg (N=429) daily vs. placebo (N=418) The primary end point was the annualised relapse rate. 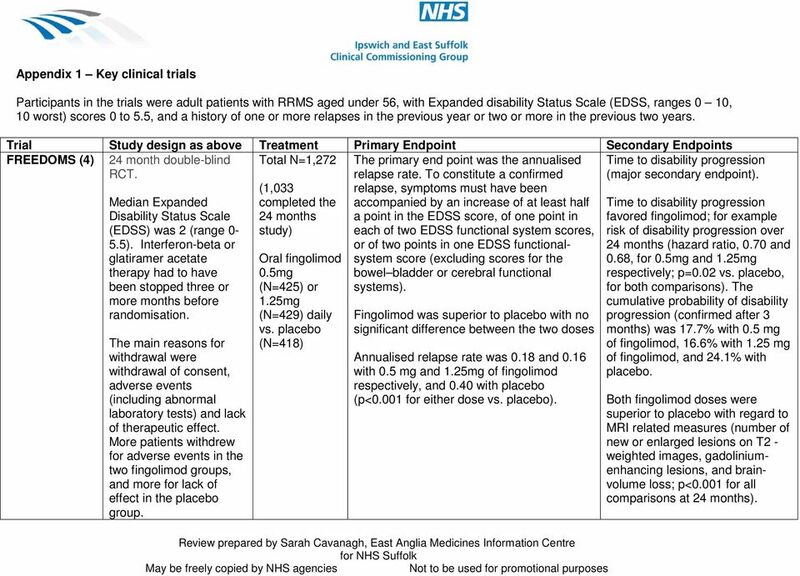 To constitute a confirmed relapse, symptoms must have been accompanied by an increase of at least half a point in the EDSS score, of one point in each of two EDSS functional system scores, or of two points in one EDSS functionalsystem score (excluding scores for the bowel bladder or cerebral functional systems). Fingolimod was superior to placebo with no significant difference between the two doses Annualised relapse rate was 0.18 and 0.16 with 0.5 mg and 1.25mg of fingolimod respectively, and 0.40 with placebo (p<0.001 for either dose vs. placebo). Time to disability progression favored fingolimod; for example risk of disability progression over 24 months (hazard ratio, 0.70 and 0.68, for 0.5mg and 1.25mg respectively; p=0.02 vs. placebo, for both comparisons). 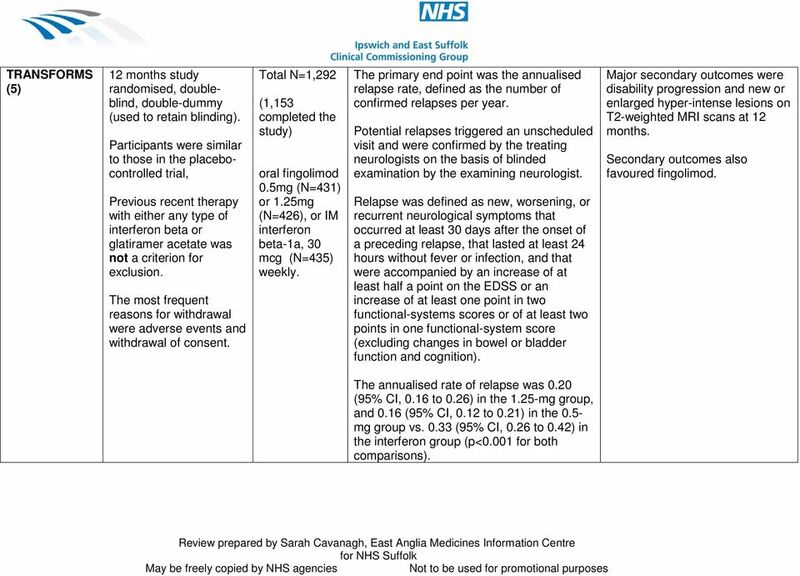 The cumulative probability of disability progression (confirmed after 3 months) was 17.7% with 0.5 mg of fingolimod, 16.6% with 1.25 mg of fingolimod, and 24.1% with placebo. Both fingolimod doses were superior to placebo with regard to MRI related measures (number of new or enlarged lesions on T2 - weighted images, gadoliniumenhancing lesions, and brainvolume loss; p<0.001 for all comparisons at 24 months). 8 TRANSFORMS (5) 12 months study randomised, doubleblind, double-dummy (used to retain blinding). Participants were similar to those in the placebocontrolled trial, Previous recent therapy with either any type of interferon beta or glatiramer acetate was not a criterion for exclusion. The most frequent reasons for withdrawal were adverse events and withdrawal of consent. Total N=1,292 (1,153 completed the study) oral fingolimod 0.5mg (N=431) or 1.25mg (N=426), or IM interferon beta-1a, 30 mcg (N=435) weekly. The primary end point was the annualised relapse rate, defined as the number of confirmed relapses per year. Potential relapses triggered an unscheduled visit and were confirmed by the treating neurologists on the basis of blinded examination by the examining neurologist. Relapse was defined as new, worsening, or recurrent neurological symptoms that occurred at least 30 days after the onset of a preceding relapse, that lasted at least 24 hours without fever or infection, and that were accompanied by an increase of at least half a point on the EDSS or an increase of at least one point in two functional-systems scores or of at least two points in one functional-system score (excluding changes in bowel or bladder function and cognition). Major secondary outcomes were disability progression and new or enlarged hyper-intense lesions on T2-weighted MRI scans at 12 months. Secondary outcomes also favoured fingolimod. The annualised rate of relapse was 0.20 (95% CI, 0.16 to 0.26) in the 1.25-mg group, and 0.16 (95% CI, 0.12 to 0.21) in the 0.5- mg group vs (95% CI, 0.26 to 0.42) in the interferon group (p<0.001 for both comparisons). 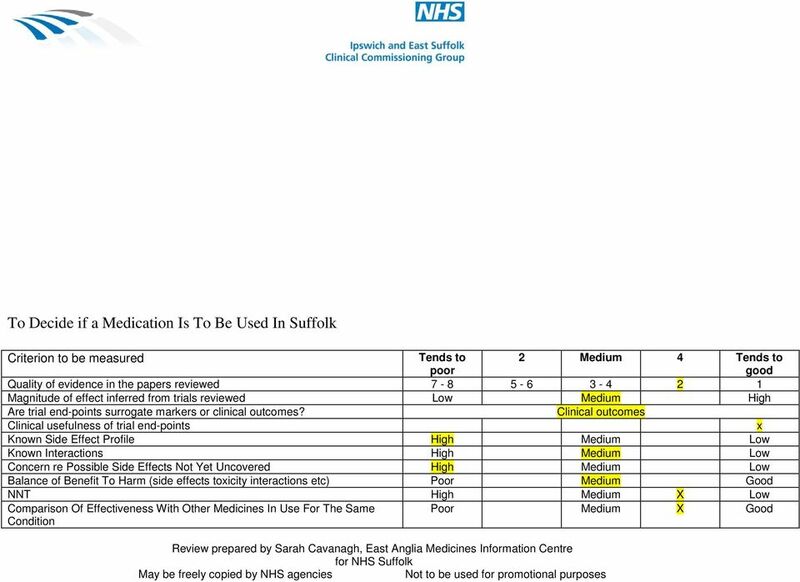 9 Grids used to assist the NHS Suffolk PCT Drug & Therapeutics Committee in reaching a decision about new medications For many years scientists have recognised two types of research: Primary: original studies, based on observation or experimentation on subjects. Secondary: reviews of published research, drawing together the findings of two or more primary studies. In biomedical science there is general agreement over a hierarchy: the higher up a methodology is ranked, the more robust and closer to objective truth it is assumed to be. The orthodox hierarchy looks something like this; Rank: Methodology Description 1 Systematic reviews and meta-analyses Systematic review: review of a body of data that uses explicit methods to locate primary studies, and explicit criteria to assess their quality. 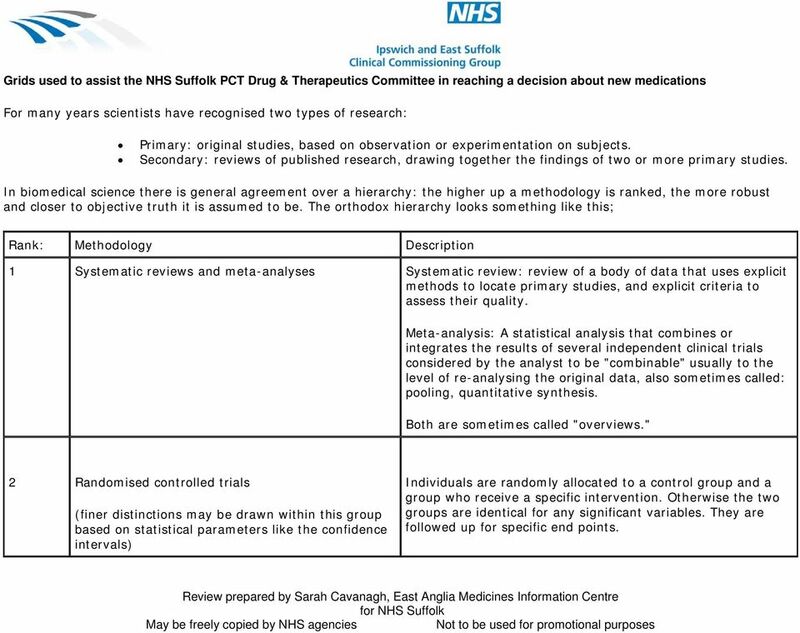 Meta-analysis: A statistical analysis that combines or integrates the results of several independent clinical trials considered by the analyst to be "combinable" usually to the level of re-analysing the original data, also sometimes called: pooling, quantitative synthesis. Both are sometimes called "overviews." 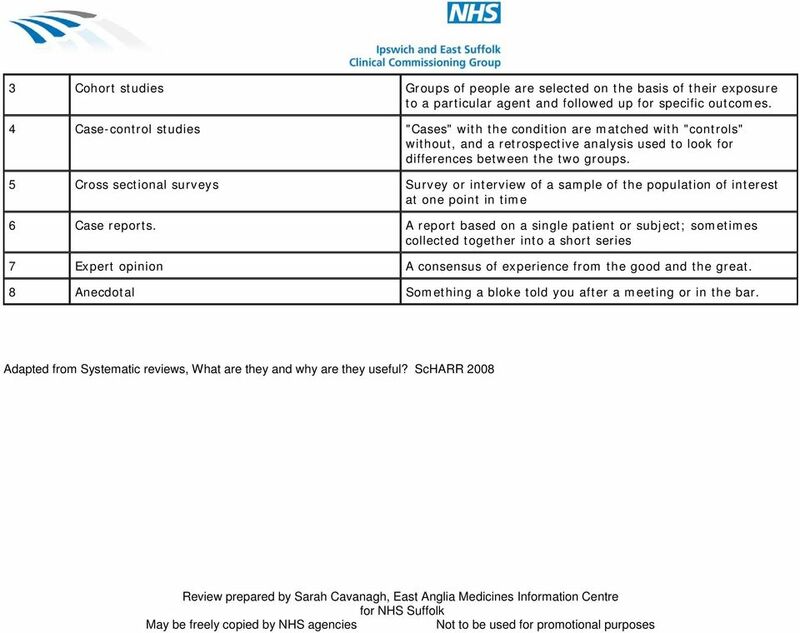 2 Randomised controlled trials (finer distinctions may be drawn within this group based on statistical parameters like the confidence intervals) Individuals are randomly allocated to a control group and a group who receive a specific intervention. Otherwise the two groups are identical for any significant variables. They are followed up for specific end points. Has the medication received FDA approval? Yes the FDA approved dimethyl fumarate on March 27, 2013.